A lot of reasons could be responsible for your iPhone X being stuck in recovery mode screen. It could be as a result of a failed iOS update, failed jailbreak or incomplete iOS restore or in some cases, hardware damage caused by dropping your iPhone, getting it wet or overheated. Whichever the reason is, there is a solution for every problem. We will be highlighting some solutions to fix the problem of your iPhone X being stuck in recovery mode. 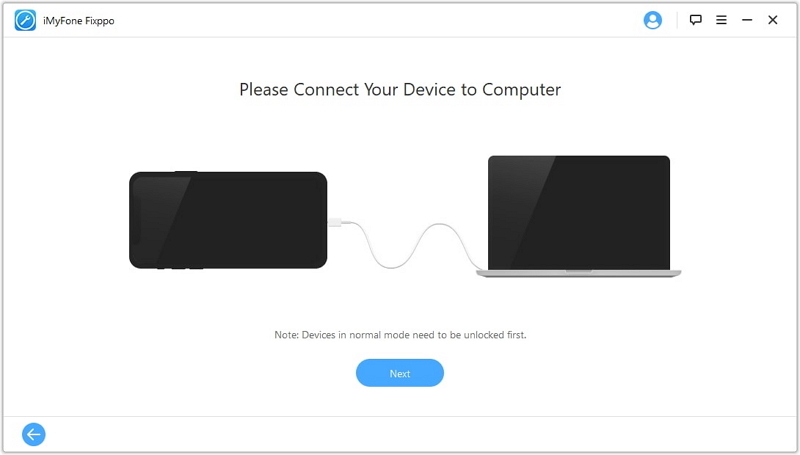 Before you connect you connect your iPhone to your computer, disconnect all other devices from the computer and close any program running on the computer, so they won’t interfere with the process. Launch iTunes after connecting your computer to your iPhone. 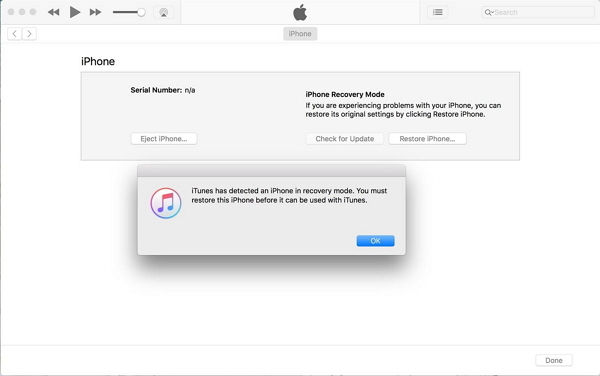 Once iTunes has recognized the phone, initiate iOS restore by following these steps. Press the volume up button and release immediately. Do the same for the volume down button. Press the power button. Hold down the button until the apple logo comes on and the screen goes into Recovery Mode. To access the recovery mode, continue to hold the power button even after the apple logo shows up. Wait for the update or restore prompt to show up and select the restore option. There are self-explained on-screen commands to guide you through the rest of the restore process. Below are the steps to follow to get your iPhone out of recovery mode. If your iPhone X is frozen, you can restart or reset the phone with a force restart. This works like the restart method of fixing minor software issues and app errors. Force-restarting your iPhone does not affect the information on it in any way. Therefore, your data is safe. Here is how to force-restart your iPhone X. 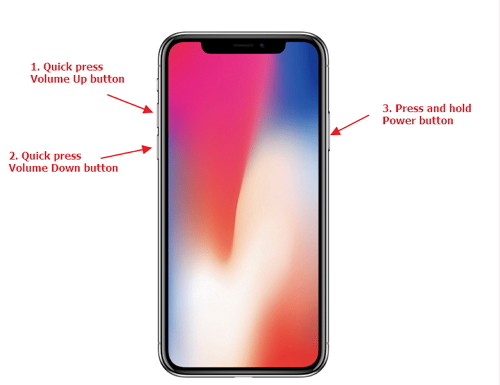 Press the power button and hold until the Apple logo shows up on the screen. Another alternative to restore your iPhone X is to use the Device Firmware Update mode. This option works deeply into the system, and with this, your iPhone can communicate with iTunes without the bootloader or iOS activating. This method is more likely to work in a situation where your iPhone is not coming on at all. However, a DFU-mode restore will lead to loss of data as every information you ever saved on your iPhone will be deleted. The only good thing about this method is that your phone will come back on to work smoothly is high. To use this more to get your iPhone out of recovery mode, follow the steps highlighted below. Connect your iPhone X to your computer via a USB cable. Launch iTunes and follow the prompts. Press and release the volume up button. Press and release the volume down button too. Press and hold the power button and wait for the screen to turn black. Once the screen goes black, holding the power button, press and hold the volume down button too. Release the power button after 5 seconds while still holding the volume down button. Wait for your iPhone X to pop up in iTunes before releasing the volume down button. Restoring your iPhone in DFU mode using iTunes is straightforward from there if you follow the onscreen prompts. Sometimes, the two options discussed above may not work. Do not despair; there are other alternatives. Apart from using iTunes, you can solve severe iOS problems with your iPhone X using some other iOS recovery and repair tools or software. These are third-party software that you can download on your Mac or Windows computer. An excellent recommendation is iMyFone Fixxpo. With the iMyFone Fixppo software, you can take your iPhone X out of recovery mode without losing the data on the phone. iMyFone Fixppo works in three modes namely, the standard mode, the advanced mode, and the quick fix mode. The standard mode is the recommended option because it lets you fix the problem without losing your data. The advanced mode is used when the standard mode fails to work, and the quick Exit Recovery mode is used to enter or exit the recovery mode in one-click. No matter what the problem with your iPhone is, iMyFone Fixppo is a capable software that can fix it for you. Let us have a look at how to use iMyFone Fixppo without data loss. 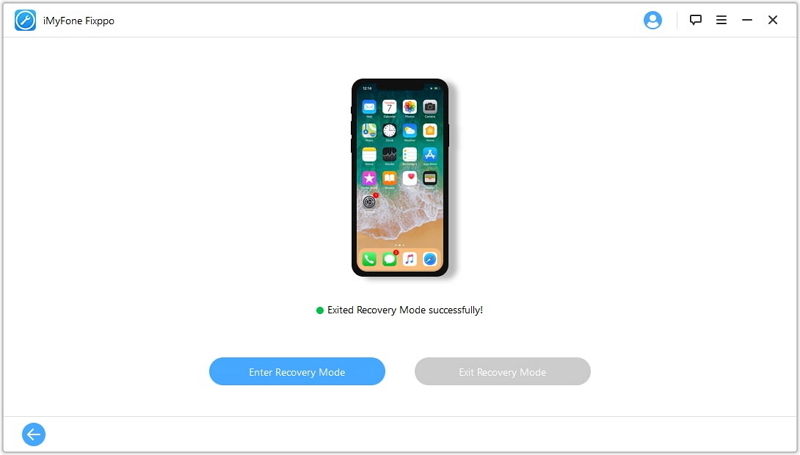 If you would like to use the Exit Recovery mode, here are the steps to get your iPhone X out of recovery mode. This is a straightforward process, and it is especially useful if the buttons on the device are broken. Step 1. Launch the Fixppo software and select enter/exit recovery mode. Connect your phone to a computer and click the next button. Your phone will go into recovery mode. Step 2. Click on the exit recovery mode button, and your device will come on as it normally should. Launch the tool and connect your iPhone to your computer. Allow the tool to detect your iPhone. Click on the “exit recovery” button from the tool’s interface. Any of the above options work effectively in fixing your iPhone X stuck in recovery mode, especially if you do not want to lose your data in the process. iMyFone Fixppo offers you this, and your phone is guaranteed to come back on after using any of the modes in the tool.